A little background in case you fell off the planet for a few days. ACTS in Prince William County was forced to shut its doors this week due to a complete lack of food. That means the 4,000 people it regularly feeds are going hungry until November 1st. 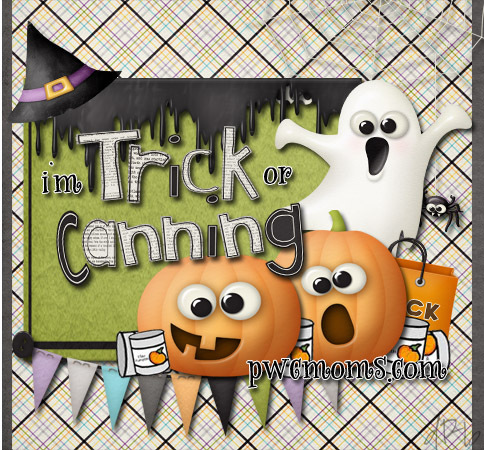 So, in conjunction with my friends at Dulles Moms, Our Life Memories, SuperNOVAMommies, and The Real Housewives of PWC, I am pleased to present you with “Trick or Canning with PWC Moms”!! Yes, Kristina, we see the cute graphic (thanks to Decembre Miller who is super talented!! If you need her contact info, just email me!) but what does it all mean?? Step 1- Print out the following letter and put it on your neighbor’s a few days before Halloween so they know you’re coming. Step 2- Change your profile picture to the Trick or Canning Logo so other people will do the same! (Or put it on your blog!) Leave a note on the PWC Moms Facebook wall with a link to your blog or letting me know you changed your profile picture and you’ll be entered to win a super cute jewelry prize! Step 4- Head out with your regular trick-or-treat bags and an extra (well-reinforced) bag for your trick or canning collection. Take a copy of the letter with you, or print out the logo and put it on your bag so your neighbors remember. Step 5- Take your collected goods to the shelter of your choice. If you or your church/group/business would like to be a drop-off site for canned goods so that people don’t have to drive all the way to the shelter, let me know and I’ll set you up! If you remember, let me know how many pounds you donated so we can tally up how great you all did!! This is not a totally out of left-field idea. It’s one we did when I was president of my Key Club in High School. It’s fun and easy and a great way for us to collect several thousand pounds of food. It’s a great project for your “too old to trick-or-treat” kids, too. Dulles Moms Fans- Liz has recommended Reston Interfaith as a great drop-off site. She has a custom letter for you all. SuperNOVAMommies- Micaela recommends FACETS for you all, and also has a custom letter. PWC Moms/Real Housewives PWC fans, we’re obviously recommending ACTS. This is such a tremendous need in our community, so please pass the word along to your friends, youth group, whatever! Let’s get out there and show them what a bunch of moms can do!! Here’s your PWC Letter. Look! There’s Spanish, too. I do not speak-a the Spanish, but I have real-live friends who do! Thanks, Gaby! We’re your friends here at _______________ and this year, we will be collecting for our food bank. You can help simply by giving us canned food when we visit your home on Halloween night. Candies for the kids are also welcome! The food will be donated to the ACTS food bank in Dumfries. ACTS is suffering from a food shortage-they have had to close their doors because of a lack of donations. We hope you will help us in this important mission. Together, we can serve our people of Prince William County. Somos sus amigos aqui en ________ y este año, estaremos haciendo una recaudación de fondos para nuestra banco de comida. Uds. pueden ayudar simplemente con darnos una lata de comida cuando visitemos su casa la noche de Halloween. ¡Dulces para los niños también son bienvenidos! La comida será donada al banco de comida ACTS en Dumfries. ACTS les está faltando comida-han tenido que cerrar sus puertas de ayuda porque no han recibido suficientes donaciones. Esperamos que nos ayuden en esta misión importante. Juntos, podemos servir a nuestra gente de Prince William County.